Canadian Folk Horror Doomers Blood Ceremony return with their fourth studio album Lord Of Misrule. The linear notes explain the origins of the title: “In a tradition that dates back to Late Antiquity, the Lord Of Misrule or “Abbot Of Unreason” was the doomed figure elected to preside over the Feast Of Fools, an annual Saturnalian bacchanalia in which masters became servants and servants masters, while drunken revelry and strange entertainments pervaded Britain and parts of mainland Europe for 30 days. At the end of the month’s festivities, the Lord Of Misrule’s throat was cut in sacrifice to Saturn.” Very much on brand then. Opener The Devil’s Widow begins with a sneaky (and I’m assuming, deliberate) nod to Pink Floyd’s Lucifer Sam before the flute kicks in and the powerchords are broken out. It’s a fairly fast paced track (for Blood Ceremony) and more straightforward rock than much of their past fare. It’s no less catchy though, sounding like some lost 70s gem you’ve stumbled across in your weird uncle’s record collection. Loreley is an exercise in somewhat poppy and Doors-esque 60s blues rock with a Stawberry Fields mellotron sound replacing the Vox Continental for added psych-ness. We’re on more familiar ground with The Rogue’s Lot, which has a doomier, proto-metal feel and bigger riffage, building to a suitably enjoyable nod-along climax. The album’s titular track is, again, pretty upbeat both literally and in terms of atmosphere, even its spooky organ outro somehow jaunty. Half Moon Street continues in the same classic rock vein while The Weird of Finistere is an eerie psych-folk ballad carried, as is the whole album if I’m honest, by Alia O’Brien‘s catchy vocals. Flower Phantoms is more weird 60s psych-pop. Old Fires a more doomy and heavier number which jams out enjoyably through its mid-section. Reflective closer Things Present, Things Past brings proceedings to a very nice, melancholic conclusion. Lord Of Misrule is an enjoyable album, a catchy album, but to me it feels kind of disposable, lacking the depth and punch of their previous work (especially the first two albums). I don’t know if the stripped down retro production values are doing them any favours at this stage either, to be honest. Alia’s vocals, flute and keyboard are the stars of the record, and everything else on Lord Of Misrule seems to have been recorded and mixed as backing. That can’t be the way Sean Kennedy, Lucas Gadke, Michael Carrillo, or even Alia herself, intended it, surely? 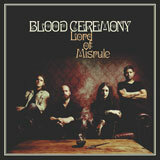 In short, Lord Of Misrule is well worth a listen but it’s not the best Blood Ceremony have to offer.